Part of F week this week included decorating the learning room window with fall leaves (the wiggly kind made out of gel). 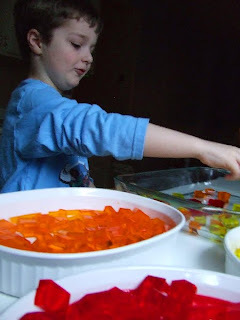 Well, while BigBoy was accomplishing his task he said, "Wouldn't it be fun to make real jelly leaves and eat them?" Um...yeah! Super fun! 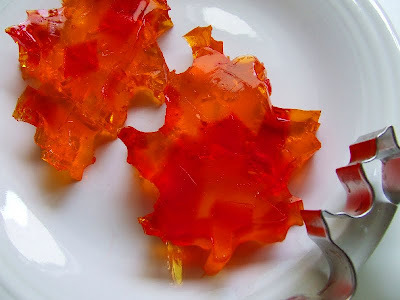 Make separate batches of *fall colored Jell-O using 2 small boxes and 2 C. boiling water. Leave them in the fridge for 3 hours or overnight to set. In the morning, have your kids cut them into small squares and sprinkle them into a large casserole dish. 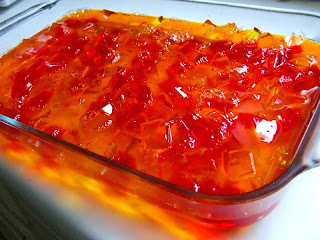 Instead of doing the unflavored gelatin and sweetened condensed milk thing, use four small boxes of Jell-O in a unifying color and mix with 2 1/2 C. boiling water. Set aside and let cool until room temperature, but still liquid. Pour it over the mixed cubes and set in fridge to set for three hours. Use cookie cutters to cut into leaf shapes and enjoy! 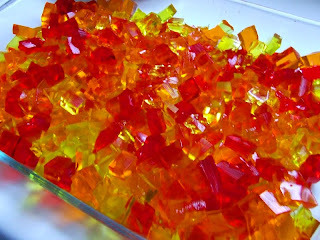 *We chose strawberry, apricot and pineapple for the cubes and poured orange on top. 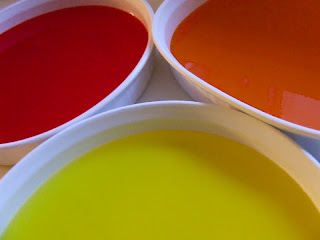 I think if we did this again, I would just use red and orange or apricot and pour yellow on the top. Our yellow cubes can be seen when you look at the leaves from the side, but not really from the top. oohh cute idea! I have a maple leave cutter.